In an organization, evergreen content consists of the posts and articles, posts, white papers, sales collateral and other content types that will always be relevant to your audience and considered up-to-date. Examples include “how to” guides and tutorials, resource lists, FAQs and glossaries, each of which benefit from the structure of custom formats suited to their use. 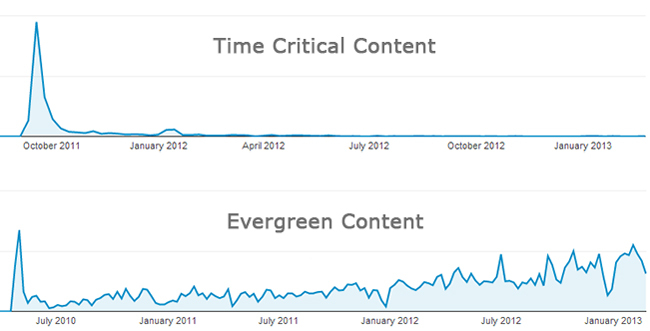 Distinguishing between evergreen and date-oriented content is the first step to making effective use of this important type of content. Examples are “How to” guides and tutorials; resource lists; Frequently Asked Questions or FAQ posts and industry glossaries (definitions). Note that these are well-suited to custom formats suited to their structure. Even the most everlasting of evergreen topics must be occasionally revisited to ensure that they’re up-to-date and continue to be correct. There are a variety of techniques to call out these valuable posts so they come to the attention of new site visitors.